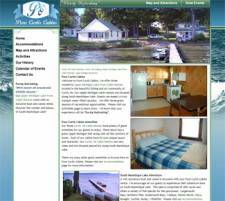 Velvet Green Creations Web Designers specialize in creating beautiful lodging websites. Hotel Web Design, Motel Web Design, Resort Web Design, Cabins and Cottages Web Design. We provide our lodging web design services for people nation-wide. We can provide our photography services for your hotel, motel, cabin, resort, or campground within a reasonable distance. We can also work with your existing photos and provide you with our web design services from hundreds or even thousands of miles away. Let Velvet Green bring new life to your Lodging Website today! Please click onto the titles of the client to visit launch websites. 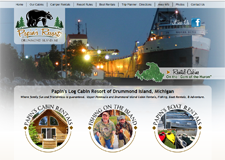 Papin's Log Cabin Resort is a family run resort where friendliness is guaranteed. Fishing and hunting are excellent and the sunsets along Drummond Island's shoreline will keep you coming back for more. Our Newberry, MI motel is located in the heart of the UP and have many great Upper Michigan Attractions within minutes from our property. Welcome to Pure Curtis Cabins. We offer three wonderful Upper Michigan Lake Front Cabin Rentals located in the beautiful fishing and art community of Curtis, MI. 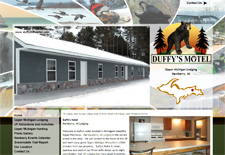 Our Upper Michigan cabin rentals are situated along South Manistique Lake. Guests can expect a truly tranquil water filled vacation. We offer three great seasons of recreational opportunities. Please visit our Acitivities page to learn more. We know that your experience will be "Purely Refreshing". Quality Inn Hotel is your Moose Capital Vacation Hub! 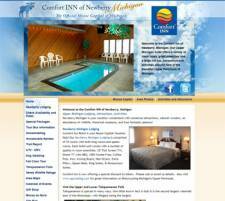 Our Newberry Michigan Lodging is comprised of 54 rooms with both king rooms and queen rooms. Each hotel unit comes with a number of quality in room amenities: 32" Flat Screen TVs, Direct TV with HBO, 100% Smoke Free, Coffee Pots, Iron, Ironing Board, Hair Dryers, Extra Pillow, Queen Beds, King Suites, & Honeymoon Suites. Welcome to the Beach Inn Motel on Munising Bay. 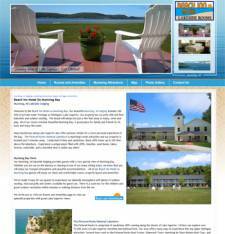 Our beautiful Munising, MI lodging includes 200 feet of private water frontage on Michigan's Lake Superior. Our property has 24 units with 2nd floor balconies and outdoor seating. The beach will always be just a few feet away to enjoy, swim and play. All of our rooms overlook beautiful Munising Bay. A great place for family and friends to sit back and enjoy the water.